Ram knows what Texans want and its evident in the new 2019 Ram 1500 Lone Star edition. The all-new version of the original “Texas Truck” made its debut last week at the Dallas Auto Show, the heart of America’s truck country. Ram’s Lone Star Edition has been a recipe for success as its the brand’s top-selling truck in Texas. The Ram 1500 Lone star models are only available in Texas, and are distinguished by unique “Lone Star” tailgate and interior badges. Introduced in 2002, the Ram Lone Star edition was the first truck designed by Texans and built specifically for Texans. Since the Lone Star’s debut, Ram has sold more than 250,000 of the Texas-only models. What does “all new” mean? Well, the 2019 Ram 1500 interior is completely redesigned, with all-new features, technology and premium materials to make it the class leader in quality, comfort and durability. Customers can choose between four interior trim levels, and a choice of six-passenger bench front or optional five-passenger bucket seats, are offered on the Lone Star. There are also several option packages available with the Lone Star edition so buyers can choose their choice of function-specific enhancements. Options include a Bed Utility Group, a 4×4 Off-road Group, a Protection Group, Trailer Tow Mirrors and Brake Group, Max Towing Package and Premium Lighting Group. 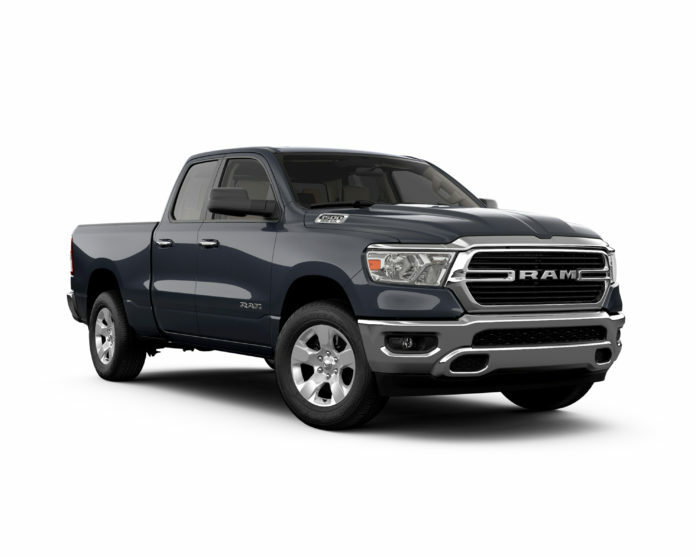 Initially, the Ram Lone Star will be availabel with the 5.7-liter HEMI® V-8, or a powerful and fuel-efficient HEMI with the eTorque mild hybrid system. A 3.6-liter V-6 Pentastar with eTorque will join the powertrain offerings later in the year. The 2019 Ram 1500 Lone Star is available with a choice of 4×2 and 4×4 powertrains, Crew and Quad Cab configurations and 5 ft.-7 in. (Crew only) and 6 ft.-4 in. bed lengths. All-new 2019 Ram 1500 Lone Star editions will be available at local dealerships in the first quarter of 2018. Buyers looking for a different look can choose from a monochromatic “Sport” and “Black” appearance package, giving them a diverse mix of interior and exterior themes for the new 2019 Ram 1500 Lone Star model.